The Holiday Inn Media Center's Grand Ballroom was filled to capacity as visitors came from all across the globe to enjoy the martial arts' one and only type of martial arts convention. 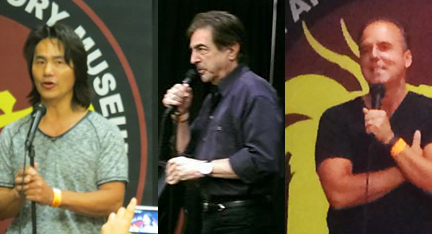 In addition to Hollywood stars, martial arts icons and pioneers each had a booth to meet and greet their fans. The list included Don “the dragon” Wilson, Cynthia Rothrock, Fumio Demura, Art Camacho, Benny “the jet” Urquidez, Tak Kubota, TJ Storm, Leo Fong, Douglas Wong, Carl Totton, Carrie Ogawa-Wong, Greg Hatanaka, president of Cinema Epoch, Eric Lee, Olivier Gruner, Ed Parker and many more. The Teenage Mutant Ninja Turtles made an appearance as well as hula dancing by Michelle Manu, unique demonstrations and clips from the martial arts industries latest films. Plus some the latest toys, gadgets and martial arts weapons. Hosted by Museum president Michael Matsuda, it was an exciting day for the martial arts world as KTLA covered the event LIVE. For information about donating to the Museum, please visit Mamuseum.com or call (818) 478-1722. The Martial Arts History Museum is a Non-Profit 501(c)(3) organization.